The Iran riyal was first introduced in 1798 as a coin worth 1250 dinar or one eighth of a toman. In 1825, the rial ceased to be issued, with the qiran of 1000 dinars (one tenth of a toman) being issued as part of a decimal system. The rial replaced the qiran at par in 1932, although it was divided into one hundred (new) dinars. In 1932, the exchange rate with the British pound was 1 pound = 59.75 rial. This changed to 80.25 in 1936, 64.350 in 1939, 68.8 in 1940, 141 in 1941 and 129 in 1942. In 1945, Iran switched to the U.S. dollar as the peg for its currency, with 1 dollar = 32.25 rial. The rate was changed to 1 dollar = 75.75 rial in 1957. Iran did not follow the dollar’s devaluation in 1973, leading to a new peg of 1 dollar = 68.725 rial. The peg to the U.S. dollar was dropped in 1975. In 1979, 1 rial equaled $0.0141. The value of Iran’s currency declined precipitously after the Islamic revolution because of capital flight from the country. Studies estimate that the flight of capital from Iran shortly before and after the revolution is in the range of $30 to $40 billion. Whereas on 15 March 1978, 71.46 rials equaled one U.S. dollar, in July 1999, 9430 rials amounted to one dollar. Injecting sudden foreign exchange revenues in the economic system forms the phenomenon of “Dutch disease” in a country. There are two main consequences for a country with Dutch disease: loss of price competitiveness in its production goods, and hence the exports of those goods; and an increase in imports. Both cases are clearly visible in Iran. The solution is to direct the extra revenues from oil into the National Development Fund for use in productive and efficient projects. Although described as an (interbank) “market rate”, the value of the Iranian rial is tightly controlled by the central bank. The state ownership of oil export earnings and its large reserves, supervision of letters of credit, together with current – and capital outflow account – outflows allows management of demand. The central bank has allowed the rial to weaken in nominal terms (4.6% on average in 2009) in order to support the competitiveness of non-oil exports. Monetary policy is facilitated by a network of 50 Iranian-run forex dealers in Iran, the Middle-East and Europe. According to the WSJ and dealers, the Iranian government is selling $250 million daily to keep the Iranian rial exchange rate against the US dollar between 9,700 and 9,900 (2009). At times (before the devaluation of the rial in 2013) the authorities have chosen to weaken the national currency intentionally by withholding the supply of hard currency to earn more rial-denominated income, usually at times when the government faces a budget deficit. The widening of the gap between official and unofficial exchange rates in 2011 stands at over 20% (as of November 2011). 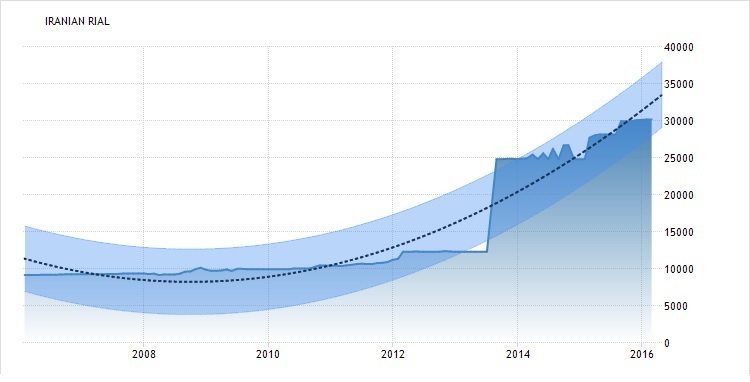 This shows the correlation between the value of foreign currencies and the domestic inflationary environment. The unofficial rial vs. 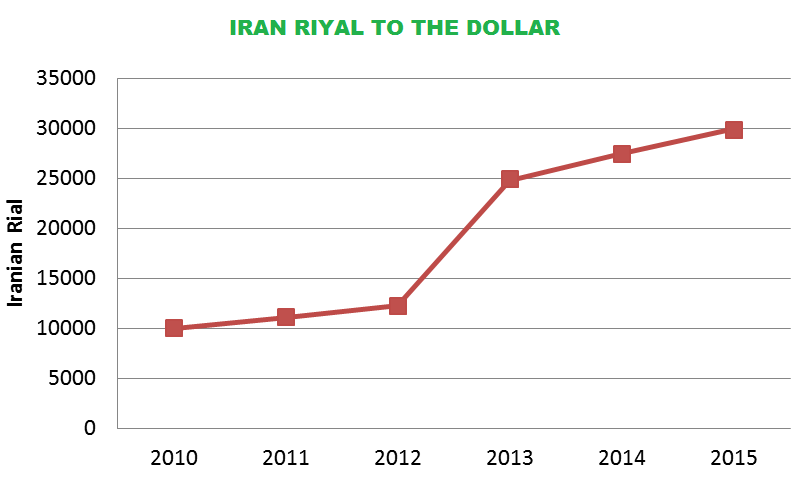 US dollar rate underwent severe fluctuations in January 2012 (losing 50% of its value in a few days, following new international sanctions against the CBI), eventually settling at 17,000 rials at the end of the period. Besides all the bad effects on the economy in general, this had the effect of boosting the competitiveness of Iran’s domestic industries abroad. Following President Ahmadinejad’s decision to liberalize the mechanism by which bank interest rates are set (granting banks the authority to raise interest rates to 21%),CBI announced that it would be fixing the official rate of the rial against the dollar at 12,260 rials from 28 January 2012 and seek to meet all demand for foreign currency through banks.